Kids Can Press, 9781771389792, 32pp. 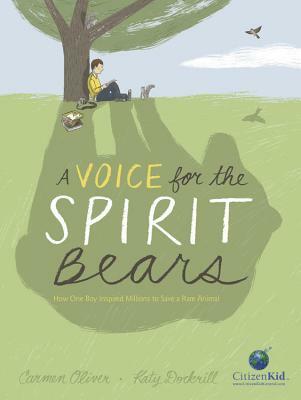 Carmen Oliver's inspiring true story is based on the early life of Simon Jackson, who founded the Spirit Bear Youth Coalition. On his remarkable journey to protect the spirit bears, he met Dr. Jane Goodall and eventually hiked the Great Bear Rainforest --- the home of these elusive animals. Katy Dockrill's captivating art adds depth and beauty to the story. Photos and additional details about Simon Jackson's life and about spirit bears are included in the end matter. Part of the CitizenKid collection, this book demonstrates how one child can be a voice for change. Simon's story is an excellent example of growth mindset at work, highlighting personal growth and overcoming obstacles through activism. This book can also be used to lead discussions about character education as it relates to courage, resilience and perseverance. In addition, it has strong science curriculum links to the environment, animal habitats and the effects of clear-cutting. Carmen Oliver is a children's author whose books include Bears Make the Best Reading Buddies. Born in Canada, she now lives outside Austin, Texas. Katy Dockrill is an award-winning illustrator whose work has appeared in children's books and magazines. She lives in Toronto, Ontario.